The young boy Amon has the mysterious power of the ancient "wind people." His father, a brilliant military scientist of the Golden Snake Empire, does not want to use his son's powers for weapons of mass destruction. He burns his papers and lab and tries to escape from the country with his family, but is killed in the attempt. Amon is taken prisoner by the Golden Snake Empire's despotic ruler, Branik, who intends for Amon's powers to produce a new super-weapon. 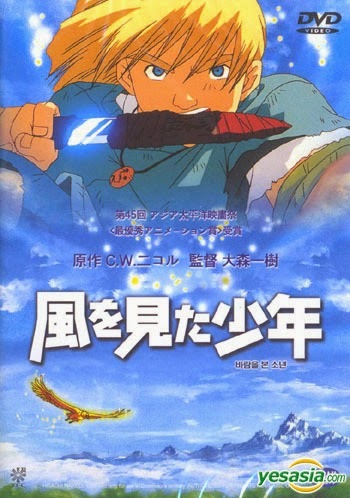 Amon escapes to Heart Island when an eagle explains to him how to see the wind and fly. On Heart Island, Amon learns a bit about the history of the wind people from a bear. He then flies off and settles in a small fishing village. There, he befriends a young girl his own age, Maria. When Branik and the Golden Snake Empire launch an attack on the village, Maria's family are killed and Maria flees with Amon. Eventually Amon and Maria are recaptured, Maria thrown in prison and Amon forced to work on weapons. Amon joins a small revolution against Branik. Looney Tunes - "Super Rabbit"